Yes, we’ve done it again! After gaining a lot of experience with the 505 panels and listening to suggestions from end users we have made further changes to the 505 panels. The gap betwen the diaphragm and the stator has been increased by 50% allowing the panel to deliver lower frequencies. The EHT supply has increased output to accommodate this change and to maintain the same sensitivity (more or less). This allows the panel to take advantage of the revised transformer with a low frequency response down to 150Hz, this makes matching the panel with a bass driver / sub-woofer easier. Rob from Australia has had good success using an SB Acoustics bass driver and a single 505 panel, follow this link to see what he has achieved. 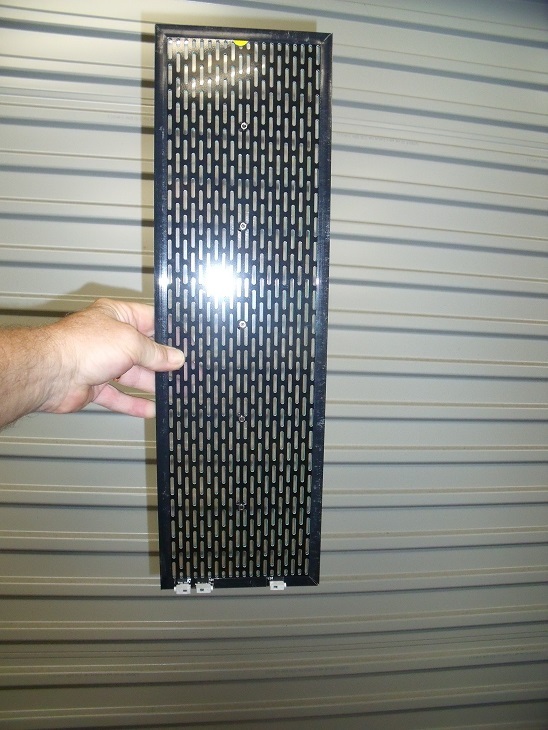 The panel has rear connections only and carries its own surface mount filter resistors, this has 3 benefits. First there are no wires leading to the front of the panel making for a neater installation, Second, due to the resistors now being on the panel there are only 3 wires leading to it. Third, we have installed screw connectors for the wires so there is no soldering to be done at the panel end. As well as the change to rear connections we have provided connections at the top of the panel that require a short link to the next panel when stacking. Again, these links are only necessary on the rear of the panel. 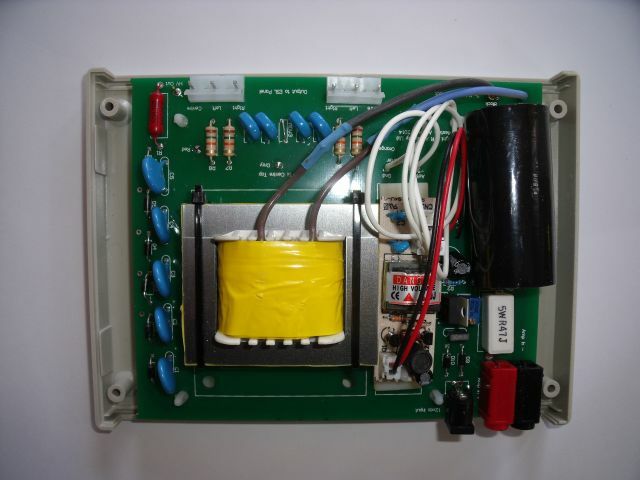 The power supply board was also redesigned to accommodate a PCB mount transformer with a 30% thicker core. This allows the transformer to go to lower frequencies before saturation sets in. Some rearrangement of the circuitry gave us sufficient room to provide a space for an on board inductor so those that are using a passive crossover can choose either a first order or second order filter and mount the inductor on the board instead of off the board in a less convenient position. The same improved electronics remain and provide room for a high quality on board crossover capacitor and an adjustable bias voltage for the panel. This features a 25 turn trimpot so the voltage applied to the panel can be very finely adjusted. Protection for the panel from over-driving or accidental spikes is provided by a series arrangement of VDR’s (Voltage Dependent Resistors) across the panel. These are essentially out of circuit until they conduct and have no effect on the sound but will shunt the signal when the cut off threshold is reached. Direct plug in banana sockets are now mounted on the board as is the 12vdc power supply socket. Output to the panel is via a header plug and socket. The panel is supplied ready built with assembled and tested electronics, you only have to connect the panel to the power supply and provide music. You do have to solder the connecting wires to the plug that plugs onto the power supply board as we can’t predict how long you want to make them, however, this is an easy task. You get 2x ready made and tested ESL panels, 2x power supplies, 2x step-up transformers and 2x regulated 12vdc plug paks. Please specify local voltage and pin requirements. The transformer and power supply are ready assembled and tested. This is truly a connect it up, provide power and play some music system!! For those that are after something a little different we can supply ready made 505 panels without the power supplies to enable stacking of multiple panels without the additional cost of multiple unnecessary power supplies. See below for suggested applications. Bass system to suit the 505 panel. Integrating a dynamic driver with an ESL is fraught with problems due to the speed of the panel versus the slower response of the dynamic driver. This coupled with the panel being a dipole and the bass driver being a mono pole can cause a noticeable sonic difference between the bass and mid / treble of the speaker. We have a small stock of 8 inch good quality alloy basket with paper cone bass drivers. These drivers work extremely well into a 15 litre sealed box and integrate very nicely with the 505 panels. The combination gives excellent performance and not just in small rooms, they can go loud and clean. 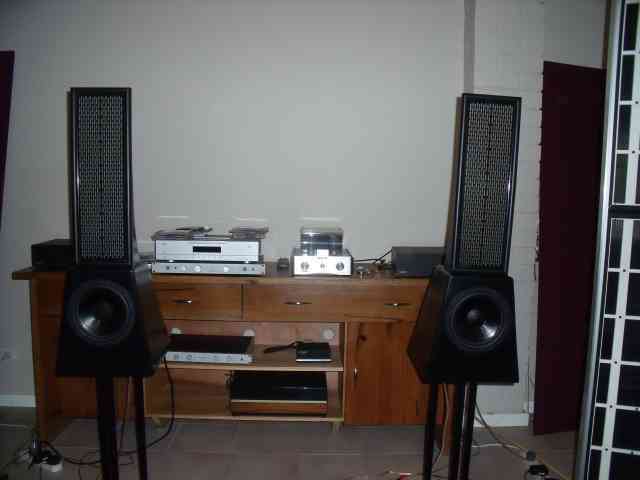 We can supply one driver for a 2.1 system or a pair of 8 inch drivers for traditional stereo. Driver cost is AUD $79.00 each. Shipping thick MDF around the word is expensive, freight costs for cabinets, even in flat pack form, are often many times higher than having cabinets made locally. We are happy to provide drawings for a suitable cabinet (the one shown above or a more simple conventional box) that is proven to work well and will suit the aesthetics of the panel. Frequency response, impedance and polar plots are below. Mid / treble driver in a 2.1 system or a full stereo system. The panels can also be used as AV rear / side effects or as a centre channel speaker when positioned on its side. For larger home theatre set-ups 2 mini panels can be used on their sides to give a 1 metre wide centre speaker. The electrical segmentation of the 505 panel will give excellent vertical dispersion. Panels can be set at a 5% angle to each other or fixed in a slightly curved frame to give optimum horizontal dispersion. 505 panels can be stacked as a very high quality line source. Two stacked panels can be driven from a single power supply, more than 2 panels need a larger transformer, see the Acorn mid / treble transformer on the ELECTRONICS page. This coupled with a quality dipole dynamic bass arrangement will give remarkable performance. Some dynamic bass types that will integrate with ESL’s in (our) order of preference. 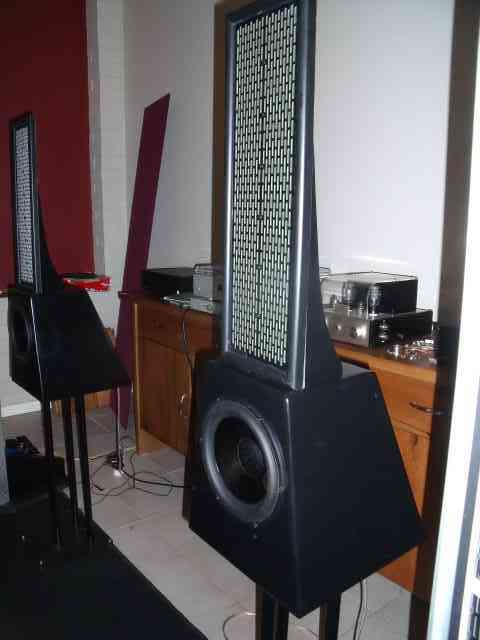 Bass systems using dynamic drivers in a dipole (open baffle) enclosure. 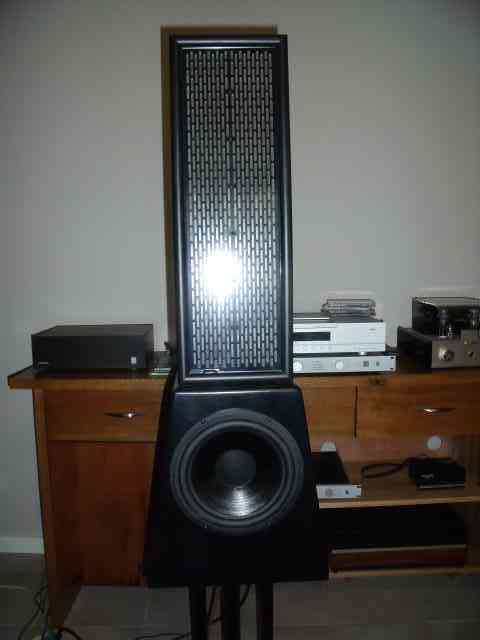 Motional feedback bass systems, preferably in sealed cabinets. Isobaric systems, preferably in sealed cabinets. Some ported cabinets and transmission line systems can sound as if they are half a beat behind the panels or slow and confused. While we do have clients that use these successfully you need to be sure that the design you want to use will work well with the panels. Power supply board showing audio transformer, input crossover capacitor, EHT supply and protection circuit. 505 mini panel shown as supplied above. The pictures to the left and right show the panel mounted in a picture frame enclosure. The panel enclosure is a simple picture frame mounted on the top of a 15 litre sealed bass enclosure. The electronics are mounted inside the box keeping everything away from prying fingers. The panel circuit board is wired separately to the bass system allowing bi-amping if desired. The low voltage 12vdc plug pak connection is made through a 2.1mm socket in the speaker connector plate. The 505 panels can be used as the satellite speakers in a very good 2.1 system or on top of or built into the front baffle of a standard stereo speaker. It is a simple procedure to extend the front baffle of the bass box to act as the panel mount. 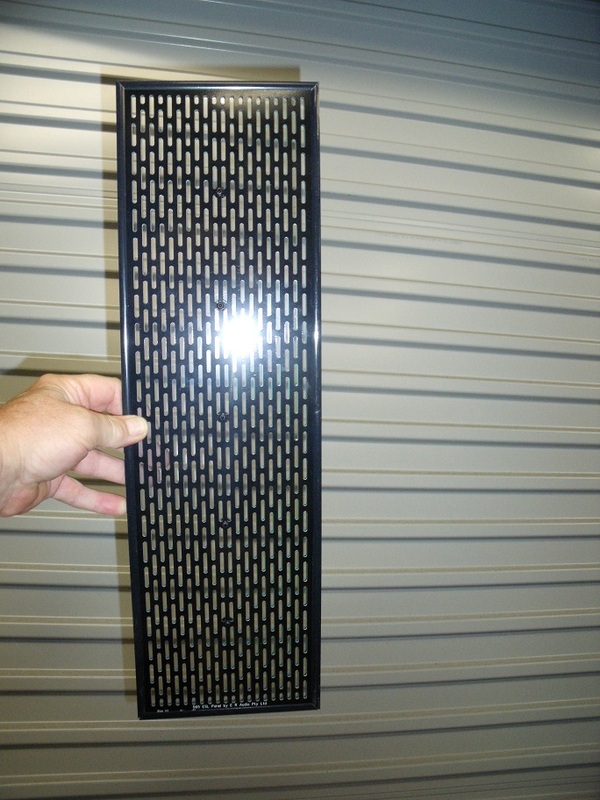 Grille cloth of any colour can be used over the panel to complement matching or contrasting frames. We are using a modest 20 + 20 watt hybrid tube amp to drive the speaker shown above. The bass circuit is a simple second order filter comprising of a 5.6uf inductor and a 65uf shunt capacitor. Performance is excellent, especially when the total system cost is considered. The panels can be driven remotely from the power supply as long as correct high voltage cabling is used. This allows you to mount the panels on a wall without the bulky power supplies alongside them. The panels can be as far away from the power supplies as 4 metres without any loss of performance. For those that are after something a little different we can supply ready made 505 panels without the power supplies to enable stacking of multiple panels without the additional cost of unnecessary power supplies. (this gets you away from the typically poor sound quality most TV’s have). We received this note below from a 505 customer, you may find the information useful. Hi Rob,I finally got round to making the video about building my hybrid speakers, I've attached it. My feeling is that there is a level mismatch so that the JBLs are probably 6db too high. But then I like a lot of bass. Not too sure about the neighbours!